It's the holiday season, and nothing says Christmas like a good musical or in this case, two. Into the Woods is also pending for opening the next week. Now the tried and updated version of the favorite orphan is back thinking about tomorrow. Will Gluck (Friends With Benefits) is producer, director and writer Aline Brosh McKenna of this hipper Annie. The original Annie of the comics was about the Depression era curly redheaded young lady and her dog Sandy who befriends rich Daddy Warbucks. This percussive hip hop take on the musical numbers give it a more updated feel and attitude. Some of the period songs from the 30's were removed, and lyrics were changed to today's world. But the main favorite tunes remain, but they sound fresher. In this Annie, Quvenzhané Wallis (Beasts of the Southern Wild) plays the plucky Annie. She lives in a foster home run by the often drunk Ms. Hannigan (Cameron Diaz) who was once a successful rock singer back in the day, but keeps the four girls in her charge for the money it brings in. Annie goes every Friday to a restaurant where she was abandoned because they had left her a locket and a note saying they would come back for her. One day she is saved from being hit by a car by Will Stacks (Jamie Foxx), a cell phone CEO who is also running for Mayor. His political advisor Guy (Bobby Cannavale) thinks this a good publicity moment that should be milked for all it's worth since he's slipping in the polls. Stacks is a workaholic and not really a people pleaser. He's obsessed with making money, so the idea of becoming a temporary guardian of Annie does not make him happy. Guy turns this all into photo opportunities and Stacks right hand assistant Grace (Rose Byrne) is actually assigned as Annie's main care giver. 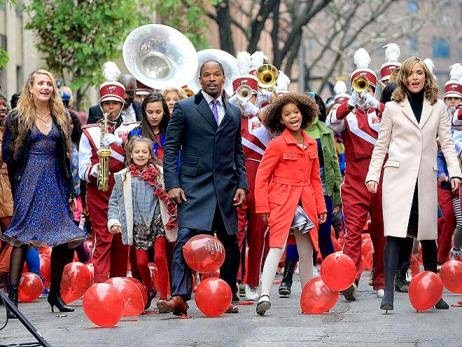 The formula story of a little girl who uses her positive personality to break the icy rich guy works with Jamie Foxx's blundering Will Stacks. He's a man who only knows how to work and spend his fortune on luxury items. He's forgotten how to relate to the world and people around him. He's easily manipulated by the ambitious Guy, and relies on Grace to complete his life without really acknowledging her. Miss Hannigan who was the heavy in previous productions actually redeems herself in this movie. Diaz's comic rubber face works overtime too. Of course it's a musical so everyone breaks out in song and dance at a moment's notice. It's not so bad as the genre goes. It's a movie that fans of the Annie world will enjoy having a young woman of color play the lead instead of the usual ginger haired girl. Maybe in the years to come there will be a Hispanic or Asian Annie, like the politically correct Disney princesses. But we will think about that tomorrow.